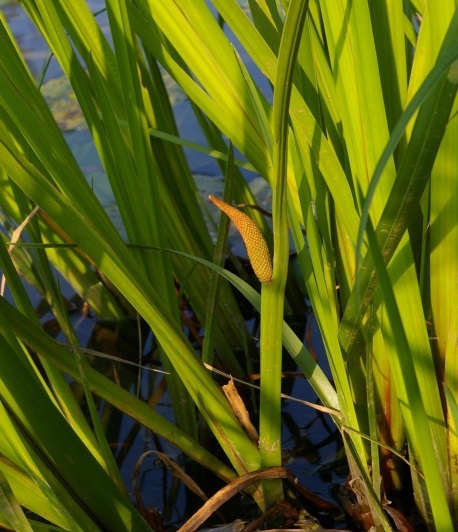 Acorus calamus is a perennial monocotyledon herb, colonial from underground stems (rhizomes), sweetly aromatic. Leaves alternate, to 2 m long, 0.8-2.5 cm wide, grass-like or iris-like, crowded at base, overlapping like iris leaves, usually bright yellow-green, midvein off center (Magee 1981). Flowers yellow-brown, minute, densely crowded on a spike 5-10 cm long, 1 cm wide, becoming 2 cm wide in fruit; flowering stalk 20-60 cm long, partly sheathing floral spike near base and leaf-like above spike; blooms and fruits May-Aug.
Habitat: Quiet pond and lake margins, marshes. Notes: Rhizomes apparently eaten by muskrats (D. Cavallaro personal communication).